The latest addition to my website is Adalet Ağaoğlu‘s Curfew. This novel is set in Turkey, primarily Istanbul and Eskişehir, in June 1980, three months before a coup will take place. We follow the story of seven main characters, all linked to one another. In all cases, the story tells of their history but also the events leading up to the 2 a.m. curfew on one specific night. In some cases, they are in a hurry to get something done before the curfew starts. All of the characters come from a fairly affluent families but all are struggling with a variety of personal problems, such as relationships, an impending divorce and a general feeling that life is not going well for them. All seven of the characters have problems which they are struggling to resolve and, in most of the cases, do not seem to be any closer to resolving them by the end of the book. Indeed in two key cases, the characters look as though they are going to be worse off than they were at the beginning of the book. 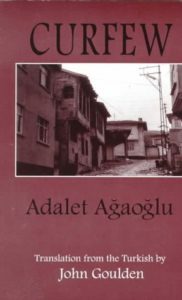 Ağaoğlu tells an excellent story of Turkey in a period of chaos.